The project got a thumbs-down from the Derby select board on May 15. But the developer says he wants the Public Service Board to have the final say, and so do the two landowners who want the turbines. Bryan Davis has been a dairy farmer in Derby Line for more than 35 years, and has always been fascinated by wind power. In fact there is already a small turbine atop a windy hill above his 160-cow barn. Now Davis wants to let Encore Redevelopment, a company based in Burlington, put up a much larger turbine to increase power supply to his farm and to the surrounding towns. "We’ve done a lot of research on these large turbines and we’re very comfortable with everything that we’ve read and learned. We have no concerns whatsoever," Davis says. 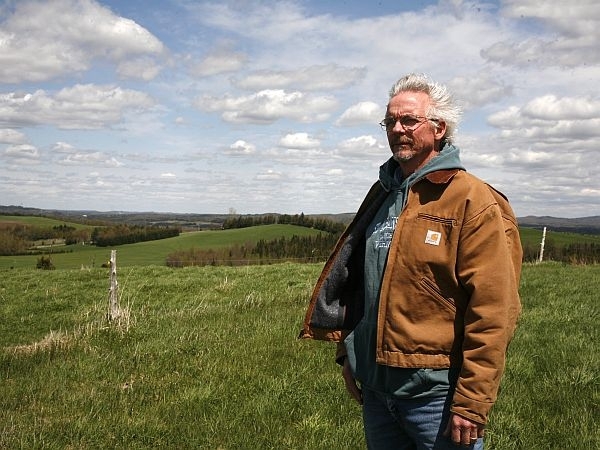 But others-especially Canadians-do have concerns, especially about another turbine going up near the Davis farm, only about 700 feet from the nearest Canadian property. Stanstead Mayor Phillipe Dutil lists a slew of objections to both turbines. "First of all in the winter time, because we know with the change of weather, the freezing rain and everything, ice forms on that, and the ice, when it comes off, could hit the houses, hit the road," Dutil warns. The Mayor also worries about flickering – the phenomenon caused when the moving blades cast constantly moving shadows on the ground. And opponents are stoking fears about the effects of blasting on local wells, and the potential for bird kill by the blades. Jean-Francois Nadeau is a Canadian journalist who began building a second home only about 700 feet from the proposed wind site. He says the project was a bad surprise. He’s led the opposition, which recently staged a well-publicized rally. Nadeau thinks Encore should have informed Canadian abutters before holding public hearings in Derby. "Because for American citizens it seems quite nice from this side because you are considering that up north over the border there’s only grizzly bears, but that’s not true, there’s a village there, there’s people living there, there’s families, there’s children, so you don’t want to hurt them, that’s the main issue here. 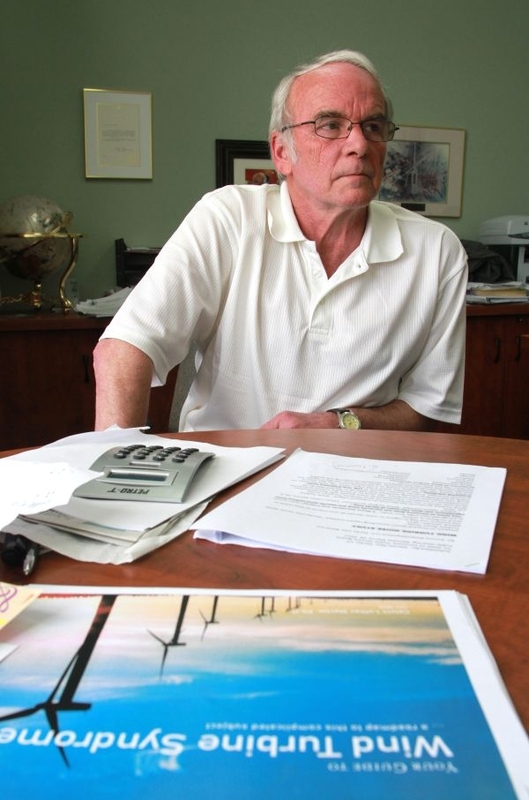 We’re not against windmills, just put them on a safer place, that’s it," Nadeau says. The recent Derby select board vote against the project was close, and it does not deter the developer, Chad Farrell, from seeking approval from Vermont’s Public Service Board. "It’s an extremely high bar that we need to meet to get a certificate of public good." he says. Farrell says the scale of this project is smaller than giant wind farms elsewhere in the state, and the power will be distributed locally, not to a regional grid. He says wind projects like these help farmers hang onto their land in the face of fluctuating milk prices. And he claims the lights and noise will not be much more disturbing than the sounds from working dairy farms and the high security lighting from a nearby border patrol checkpoint. "We have two projects that make a lot of sense and will not result an any undue adverse impacts to human health or the environment," Farrell says. His partner, farmer Bryan Davis, says he will welcome a monthly lease payment, though he will not disclose the amount. Surrounding U.S. towns would also get payments. For Davis, as for other supporters, wind is an environmentally friendly alternative to fossil fuels. But it’s still not clear which way the wind will blow at the Public Service Board. The scheduling is temporarily on hold, and Stanstead will be allowed to make its case against the project before the board. Newport Daily Express reporter Laura Carpenter on a proposed wind project in Derby Line, and the opposition from the town and its neighbors in Stanstead, Quebec.